General water problems in a hot tub can be avoided by being sure there is enough sanitizer in the water (bromine or chlorine – never mix the two) and that the pH level is between 7.2-7.6. A water test kit or test strips can be used to monitor hot tub water health. If water problems such as foaming, bad smell and cloudiness occur, it is important to understand some basics so the treatment does not increase the problem. First of all, hot water scents and aromatherapy fragrances should not be used to mask hot tub odors that may be caused by poor water chemistry as the problem is still there and can be addressed head on by using a shock treatment in the water with a non-chlorine shock. Similarly, foam problems are not solved by a de-foaming. These products can reduce the foam in the spa so it can be used, but the underlying problem of why the spa is foaming needs to be addressed. Are bathing suits or hair full of shampoo, soaps or oils? If so, it is best to shower off before getting into the spa. Foaming is a result of poor pH (outside the ideal range of 7.2-7.6) but also too many TDS or total dissolved solids in the water. There are products that bind/coagulate particulates in the water so that they can end up in the filter. See Hot Tub Outpost for details on the right hot tub chemicals for your spa. 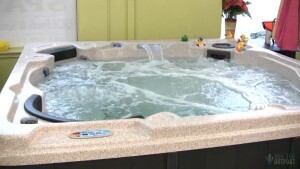 To maintain a hot tub, you will need to regularly test the water. Having a dirty filter puts a lot of stress on the pump. The pump has to work a lot harder to pull water through the filter. Cleaning a filter and switching it out is a better way to keep the chemicals working right and also more economical. The pH is important in the spa and should be held between 7.2-7.6. Check the water 3x a week using the Monday-Wednesday-Friday hot tubwater care program at Hot Tub Outpost. For sanitizer, either chlorine or bromine is used. A pre-filter can also help eliminate contaminants and take out rust and iron while refilling the spa before it gets in the hot tub water in the first place. Replacement spa filters are available at www.HotTubOutpost.com.